Shares of West Fraser Timber (WFT.TO) slipped on Monday, ending a winning streak that had propelled the company's stock more than 14 per cent higher as the nation’s largest lumber company by market capitalization was boosted by wildfires in British Columbia and the subsequent rise in underlying timber prices. After closing higher for eight straight sessions through the end of last week, West Fraser's stock ended Monday down 0.3 per cent to $91.27 on the TSX. The stock had been on its longest winning streak since February 2017. After a brief decline from record highs earlier in the summer, lumber prices have rallied back to US$472.50 per thousand board feet, well above the historical average. 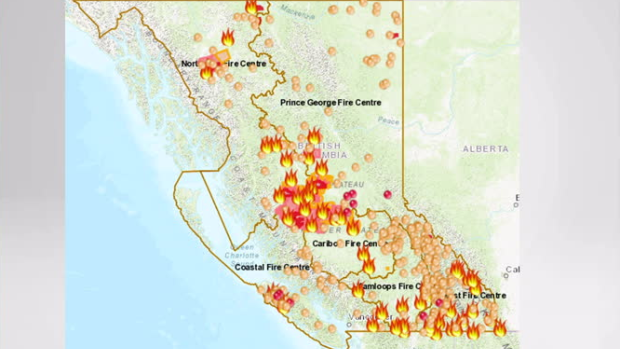 While the company’s operations have not been directly affected, West Fraser acknowledged on its website that the fires are creating a “difficult and stressful time” for many of its employees. West Fraser is planning to operate its mills for as long as it is safe to do so. Shares of West Fraser have responded in kind to the rally in lumber prices, bouncing back after some softness amid concerns over shipment bottlenecks and slowing U.S. homebuilding demand. Housing starts south of the border slowed to a 1.17-million annualized pace in July, sending shares of lumber producers lower. In spite of initial concerns U.S. softwood lumber tariffs would take a toll on Canadian producers, thus far they have been able to pass along the costs to consumers. West Fraser posted record sales and operating earnings in the second quarter, as earnings per share rose 137 per cent from a year ago. The company was charged $81 million worth of anti-dumping and countervailing duties in the quarter. West Fraser has also gotten a lift from the favourable exchange rate. Since the company books a large portion of its costs in Canadian dollars and sells lumber priced in greenbacks, it is typically boosted by a lower loonie. Though shares in the company have rallied nearly 50 per cent over the last year, the analyst community is still taking a modestly positive view on its potential to push higher. West Fraser has four buys, three holds and not a single sell rating, with an average 12-month price target of $102.29, implying an 11-per cent upside.